Thank You SO MUCH for Your Prayers & Financial Support! Place Tempeh on rack. Put IP SEALING CAP to Pressure Cook. Select MANUAL and Set for 10 minutes. 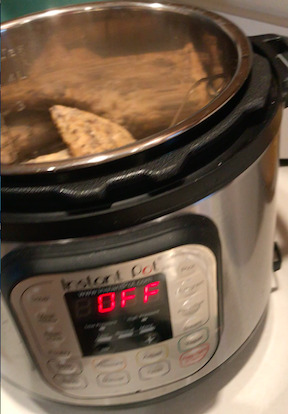 After 10 mins Pressure Cook time – ALLOW TEMPEH TO REST in the IP 8-10 minutes. THEN, flip the SEALING CAP FORWARD to RELEASE STEAM…careful to keep hands/fingers away from valve (SEE VIDEO). Remove cooked Tempeh from Instant Pot and marinade in BBQ sauce 5-6 hours. Heat and serve! ENJOY! More recipes soon to come!